Hello, Guys, we have exciting news for those youngsters who are looking for the job in Northern Power Distribution Company of Telangana. Here, in this article, we are going to share all the detailed information regarding the TSNPDCL Vacancy 2018 in the below discussion of this post. All the interested and talented Candidates who want to do a Job in Northern Power Distribution Company of Telangana must read this complete article with proper attention and take all the vital details from here. 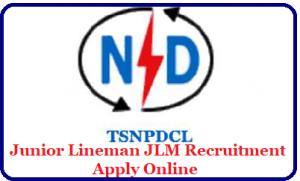 Contenders may apply online for this TSNPDCL Junior Lineman Recruitment 2018 from the official website of the Northern Power Distribution Company of Telangana that is www.tsnpdcl.cgg.gov.in. For the latest details, you may check our careerjobs360 official page & get all the latest news from here. The Northern Power Distribution Company of Telangana has recently depicted the job notification for TSNPDCL Vacancy 2018 to hire eligible & well deserving aspirants for 2553 no. of Junior Lineman Posts in the department. The Northern Power Distribution Company of Telangana is looking for the eligible and skilled aspirants at the various vacant posts. Job Finders, who are looking for the latest government job in Northern Power Distribution Company of Telangana. Interested youngsters may apply online for this TSNPDCL Junior Lineman Recruitment 2018 from the official website of the TSNPDCL department. You may submit the application form on or before the closing date i.e. 19th March 2018. Moreover details, regarding the TSNPDCL Jobs 2018 like Academic Qualification, Age Limit, Application Charges, Salary Band, Selection Procedure & How to apply online etc in the below post. Educational Qualification: Interested aspirants must have completed SSLC/SSC/10th Class with I.T.I. qualification in Electrical Trade/ Wireman or two years Intermediate Vocational course in Electrical Trade only from a authorized Institution/Board of combined A.P/ Telangana State Education Department as on the date of advertisement. Age Limit as on 01st January 2018: Minimum age limit of the candidates is 18 years of age and Maximum age limit of the aspirants is 35 years. However, the upper age limit is permissible up to 5 Years for SC/ST/BC category of candidates. Selection Procedure: Aspirants will be selected on the basis of their performance in the Written Examination, Personal Interview, which is going to be conducted by Northern Power Distribution Company of Telangana. Application Form Fee: Aspirants will have to pay an amount of Rs 100 as application charges and Rs 120 as examination form fee to apply for this post. However, all the SC/ST/BC category of candidates are exempted from application form fee. How to Apply for the Northern Power Distribution Company of Telangana Recruitment 2018? First of all, interested candidates need to go to the official website of the Northern Power Distribution Company of Telangana that is tsnpdcl.cgg.gov.in. Download the official notification and read all the instructions carefully from the official notification before applying online. Find the official link for the TSNPDCL Junior Lineman Recruitment 2018. Now, you may fill all the details very attentively in the application form without making any mistake. Upload the scanned copies of the documents according to the requirement and the passport size photograph and the signature with the application form. Verify all the details and finally click on submit tab button.